MCD decided to drop Formula Atlantic after 1975 and it was taken over by a group of drivers led by Peter Wardle. The new series, named Indylantic, was not widely welcomed by the motor racing press who pointedly reviewed it under the heading of Club Racing at the end of the season. The main contenders for the title were Americans Ted Wentz (Lola T460) and Tony Rouff (Boxer PRA76) and some needle entered this battle before it was resolved, by a mere five points, in favour of Wentz. Trimmer only entered five races in his Lola T460, winning three and finishing second and third in the other two. He had led the championship before his car was sold and it was too late by the time he was able to acquire a replacement. Among the many compexities of Indylantic was the qualifying system which changed after the first four rounds from the traditional concept of seeing who recorded the fastest in practice to a points system based on three seven-lap qualifying races. Many Formula Atlantic cars entered the Group 8 series instead. Not a single March scored a point in the Indylantic series where a hypothetical constructors title would - on the basis of the results known so far - have been won by just one point by Chevron over Lola with Boxer, Modus, Surtees and Sana next. This series ran over 12 races and used a particularly bizarre points system. The table above has been constructed using the points theoretically awarded at each race and decyphered by Chris Townsend. See Chris's full points table. The results here have been compiled by Chris Townsend using Autosport and Motoring News. Not all the results are complete; results sheets or details of non-starters are needed for Brands Hatch	4 Apr 1976, Brands Hatch 6 Jun 1976 (retirements only needed), Thruxton 8 Aug 1976 and Brands Hatch 3 Oct 1976 (retirements only needed). The only entry list still needed is for Silverstone 5 Sep 1976. Grid sheets or details of qualifying are needed for most races: Croft 31 May 1976, Mallory Park 11 Jul 1976, Knockhill 1 Aug 1976, Thruxton 8 Aug 1976, Brands Hatch 26 Sep 1976, Brands Hatch 3 Oct 1976 and Oulton Park 16 Oct 1976. 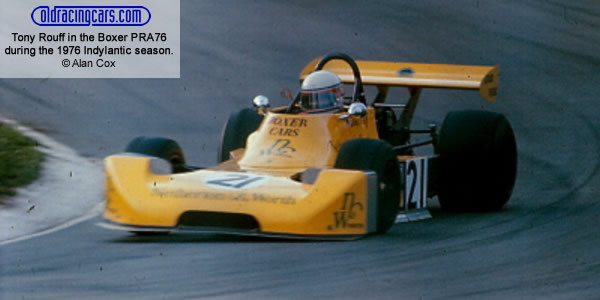 Chassis indentification is largely from chassis plate observations by Adam Ferrington and others, plus Lola and Chevron production records. More details of the 1975 Van Diemen GRD would be very helpful.